The launch of Model, Gigi Hadid’s Spring 2017 collection with head designer Tommy Hilfiger for the self-titled fashion brand, Tommy Hilfiger, has changed the way we consume fashion with the attitude of ‘see now, buy now’. A fairly recently established brand itself, Tommy Hilfiger plays to the strengths of Hadid’s social media following to act as a source of rejuvenation for the classic and preppy New York inspired fashion brand. In this way, now more than ever, social media and the internet acts as a way of bringing a consumer closer to a fashion brand. Typically, consumers would see new collections and have to wait to buy them. The forward thinking from Hilfiger’s team makes the new clothes current. The use of the #TOMMYNOW thread commonly used on social media platforms, Twitter and Instagram, is being used on Tommy Hilfiger’s own website. By doing this, consumers feel more connected to the brand, as they are going directly to their website to not only view the runway show, but feel as if they are a part of the show from the much sought after front row. 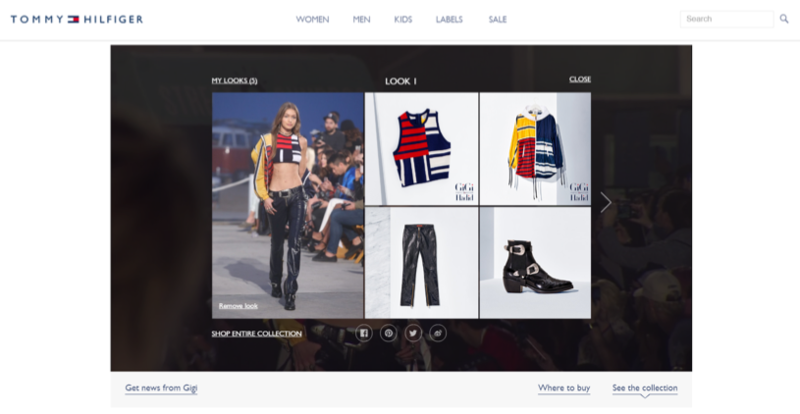 This kind of immediate access the team at Tommy Hilfiger have allowed is brought to fruition through the interactive element on their website. Whilst screening the runway show for the collection, there are options to save looks as they walk down the runway and add them to your saved looks. By being able to save looks, consumers are given looks as examples and clicking on each look allows the consumer to see each piece individually. It is perhaps questionable whether or not this way of presenting a collection helps someone’s creativity, in that the consumer is given the designer’s vision of a look. However, this could be seen to give context and, in effect, help in putting together different looks. The ability to interact with the collection also personalises it for the consumer and creates a more intimate relationship, in that each piece can be viewed individually, but are placed alongside other pieces which match an aesthetic or look the designer is trying to achieve. The live runway show of this collection being streamed on the Tommy Hilfiger website also creates the idea of fashion to be an experience with its interactive elements. Part of the consumer being able to choose which looks to save and pieces to buy, gives them more control. In effect, the person watching the show feels as if they are there in the front row. What emphasises this is the utilising of social media hashtags to give the brand more exposure to a wider audience. Immediate, quick and easy is the new way to look at purchasing clothing. #TOMMYNOW gives the consumer complete control and immerses them in a fashion experience which doesn’t restrict this experience to physically being at the show. With the internet dominating exposure for fashion brands and the relevance Model’s such as Hadid have, the internet gives unprecedented access to collections, which fashion-lovers globally can enjoy.